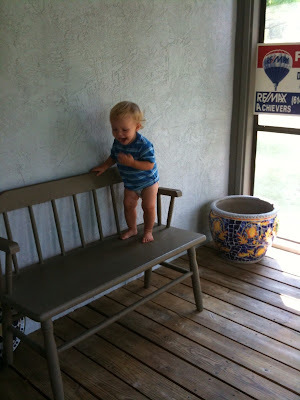 You know you have a toddler when . . .
His forehead (and elbows, knees, shins, and hands) require you to constantly tell of his most recent tumble simply so that no one suspects you of child abuse. You experience a moment of, "Oh Dear Lord, I've lost my child!" only to find him giggling away right under your nose. 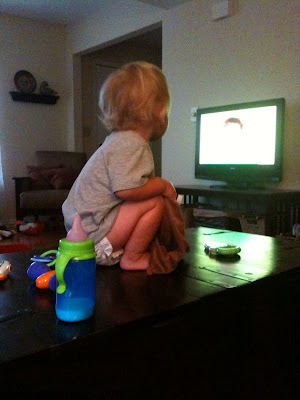 You find him watching cartoons from the most unusual of surfaces. And in the most uncomfortable of positions. Once again, you think that you have lost him and will surely find him knocked unconscious somewhere in your house only to find that he's wiggled his way onto the back porch and is having the time of his life. You often find your dog communicating to you, "it wasn't me this time, I promise." Your once well-fed dog has given up on eating and drinking for fear of what he might find in his bowl.